Vegan and Gluten-Free Thai inspired 30 minute lentil rice soup made with red lentils, red rice and massaman curry paste. Soup and dinner in one. It has been one hell of a week for me. Busy busy busy. Tons of moving around. Planes, trains, buses, taxis. City walking tours, mud volcano dips, beach side swim sessions, from intense heat to rainy cold, it has been a week of contrasts. After spending a month renting an apartment in Medellin, Colombia it was time to hit the road. Three days in sunny and hot Cartagena, followed by 2 days in chillier and rainy Bogota, finished off our time in Colombia. 3 flights in 3 days took us around and out of Colombia and into Peru, where my parents have met up with us. And tomorrow of all places I’ll be setting off for a full day of hiking around Machu Picchu!! With warm days and much cooler chillier nights here my soup cravings are in full swing. And luckily for me Peru seems to love quinoa just as much as I do. Quinoa is advertised in tons of restaurants and cafes, from salads to soups to sides. Yes yes yes. You know I love my quinoa soups (cue vegan quinoa black bean pumpkin soup). But I equally love my red lentil soups too. Remember my Thai vegan veggie burgers? Well I am on a Thai infused massaman curry kick and it turns out it works perfectly for soup as well as veggie burgers. So hello Thai lentil rice soup. While I have made a bunch of different red lentils soups in the past, I wanted one more. A version with lots of ginger, garlic and the flavorful massaman curry paste. And I had bought a big bag of red rice in Colombia and couldn’t resist adding that too, for a hearty and full on soup turned into dinner meal. I love the flavor of red rice – so much heartier and more flavorful than regular rice, it’s almost nutty. 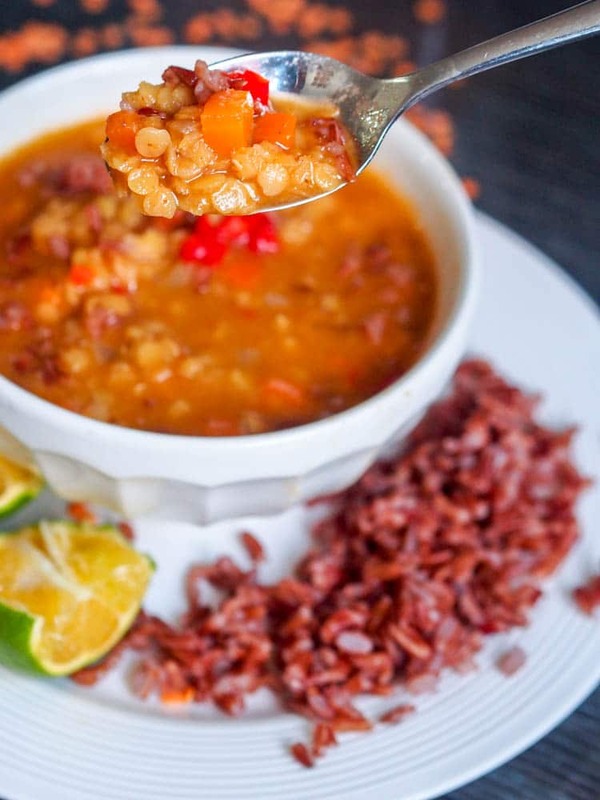 The red rice pairs perfectly with the soft lentils and the Thai flavors in this lentil rice soup. Both gluten free and vegan. The ultimate healthy dinner meal, perfect for cool March days! This Thai lentil rice soup also comes together in only 30 minutes! 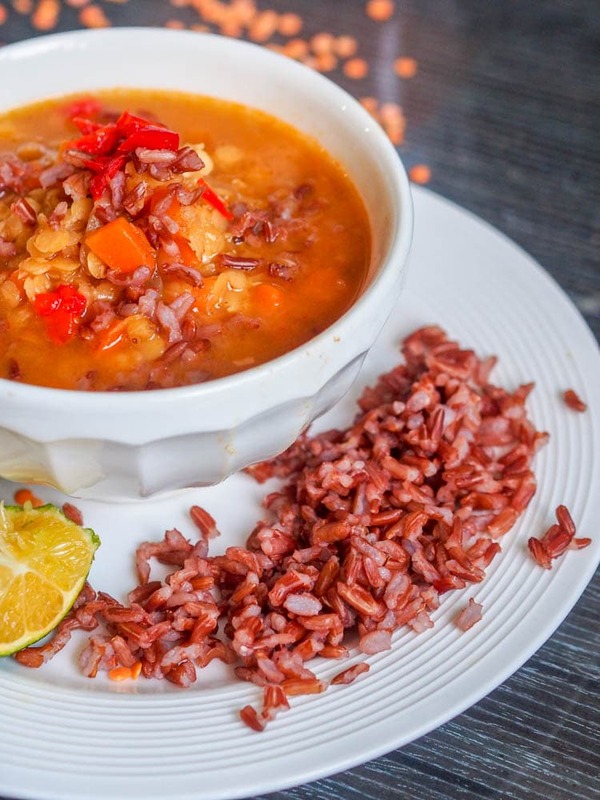 Vegan and Gluten-Free Thai inspired lentil rice soup made with red lentils, red rice and massaman curry paste. Soup and dinner in one. Add massaman curry paste and mix everything together, cooking for 1-2 minutes. Add red lentils and stir. Add vegetable broth and tamari. If you are using cooked carrot add it now (if you made your own vegetable broth use the cooked carrot from the broth). 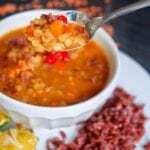 Bring soup to a boil, reduce heat and simmer 10-15 minutes until lentils are cooked (add more broth if needed). Serve with red rice and a squeeze of lime juice.